The global smart water meter market was valued at US$ 21.8 Mn in 2017 and is projected to register a compounded annual growth rate (CAGR) of over 13.42% from 2018 to 2026, according to a new report published by Transparency Market Research (TMR) titled ‘Smart Water Meter Market – Global Industry Analysis, Size, Share, Growth, Trends, and Forecast, 2018–2026.’ The report suggests that rising adoption of smart water meters to reduce the non-water revenue, enhancing focus on development of the smart water meter infrastructure across the globe, and increasing development of LPWA (low power wide area) technologies that offer better coverage and network connectivity for smart water meters are likely to augment the demand for smart water meters from 2018 to 2026. 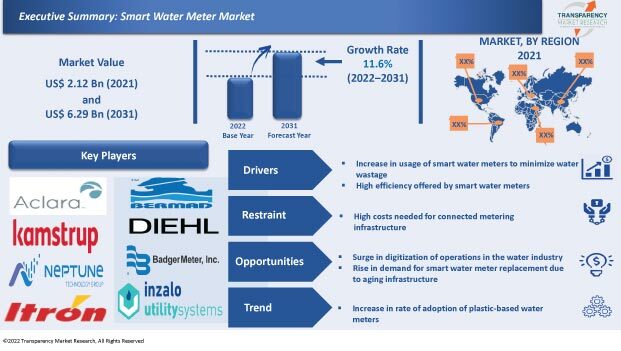 Since key market players are introducing new smart water meters in developed markets such as North America, Europe, and Asia Pacific, these regions are likely to account for a leading share of the global smart water meter market during the forecast period. Rising government focus on developing smart cities and increasing government investments in deployment of smart water meters across emerging markets such as China, Japan, South Korea, Australia, and India are likely to boost the smart water meter market in Asia Pacific from 2018 to 2026. Smart water meters emit short radio waves that help in taking meter readings from a remote location. Users are worried about the negative impact that these radiations can cause on the human health. Furthermore, there is a misconception that smart water meters deployed on streets affect children as well as adults, as these meters emit harmful radiations. However, in 2018, a study conducted by Public Health England, a government organization in the U.K. that takes care of public health, claimed that radio waves emitted by smart water meters are safe. Moreover, American Cancer Society, Inc., a nationwide voluntary health organization, also stated that though smart water meters emit RF radiations, these radiations are of lower energy level than those emitted by smartphones and, hence, they are unlikely to cause cancer. In terms of application, the smart water meter market has been segmented into residential and commercial/industrial. Smart water meters provide accurate meter reading at regular intervals, without any need for manual collection of reading by standing near the meter. This saves time and allows utilities to get accurate information about billing. Furthermore, when deployed in a household or residential space, smart water meters help detect any kind of water leakage, as smart water meters have ability to notify water leakage by using cellular networks. This allows utility companies to take a rapid action to avoid any further water loss, especially in the areas where water scarcity is a significant issue. Additionally, due to increasing non-water revenue, utilities are facing significant financial loss, as they are spending largely on detecting water leaks. Hence, adoption of smart water meters is increasing across the globe and governments across all countries including the U.S., Germany, the U.K., India, and GCC are investing heavily in replacing older water meters with smart water meters. North America is expected to hold a major share of the global market for smart water meter during the forecast period. Leading share of the region is primarily attributable to strong presence of well-established players across the region, especially in the prominent economy i.e. the U.S. Moreover, the U.S. Government is investing heavily in deploying innovative smart water meters in place of older water meters across the country. North America is home to several well-established players that manufacture smart water meters, including Badger Meter, Inc., Sensus USA Inc., and Itron Inc. Furthermore, the region is witnessing high adoption of smart water meters due to continuously increasing government investments in the region. Several manufacturers in the region are focusing on enhancing the quality of their products and developing innovative products to capture a wide customer base. For instance, in June 2018, Itron Inc. introduced an innovative product called Itron Intelis smart water meter at the AWWA Conference. Itron Intelis smart water meters offer additional water management capabilities and advanced metering infrastructure (AMI) through Gen5 networks and Itron’s interoperability. The report includes profiles of well-established players such as Kamstrup A/S, Diehl Stiftung & Co. KG, Badger Meter, Inc., Itron Inc., and Sensus USA Inc. These players are focusing on comprehensive organic growth. For instance, in 2018, Kamstrup A/S opened an innovative manufacturing plant in the U.S. for production of smart water meters. According to the company, the new manufacturing facility would help increase the production and meet the continuously increasing demand.